It’s National Dance Week and Santa Cruz isn’t about to sit on the sidelines watching. 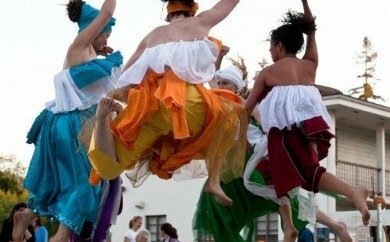 Santa Cruz, in fact, has established a tradition in observing National Dance Week, and the group Santa Cruz Dance has lots of movement-oriented activities scheduled for the coming week, featuring literally hundreds of performers. The observance begins today with “Dancing in the Streets” from 5:15 to 9 p.m. on the streets of downtown Santa Cruz. Among those who will be performing on three stages throughout downtown are Motion Pacific Studio, the Dixie Lee Fun Dance company, UC Santa Cruz’s Random with a Purpose, Marsea Marquis, Te Hau Nui, Dance of Brazil, Bailamos Salsa Rueda, Santa Cruz Ballet Theatre, Dietzman and Co., the Tannery World Dance & Cultural Center, and more. It is all to culminate with a fire-dancing performance by the local troupe Nocturnal Sunshine. The stages will be located at Church Street at the Civic Auditorium, Church Street at the Main Branch of the Santa Cruz Public Library and Center Street at City Hall. Open free classes for several types of dance, from salsa to samba to ballet, will be held from Friday until April 26. And in its “Dance in Unlikely Places” series, Santa Cruz Dance will organize a series of artists performing in restaurants, cafes, bookshops, retail centers and other unusual venues.